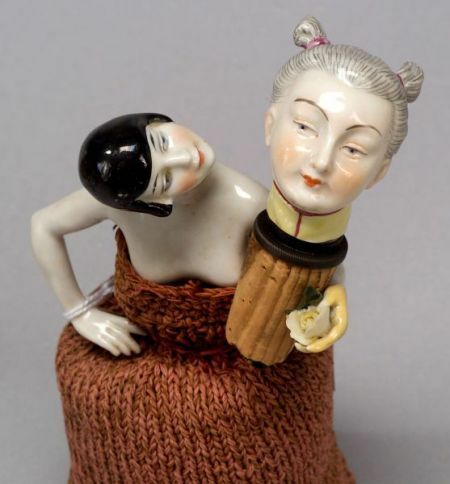 China Half Doll with Removable Head and Porcelain Oriental Lady-Head Bottle Stopper, Germany, early 20th century, pincushion half doll on wooden base, long knitted dress, lady head with black flapper hairdo, (left hand repaired), ht. 7 1/2; and a bottle stopper, possibly Meissen, with beautifully modeled head, gray upswept hairdo, yellow mandarin collar, metal ferule around neck, ht. 2 in.